When the Android Market rebranded itself as Google Play, it brought with it a considerable amount of new content, including movies and TV shows to buy along with magazines too. At the time, outside of the U.S., very few of these new stores have been opened, however Google has been working hard to solve the licensing issues that no doubt plague its stores, resulting in new countries being added to the list all the time. Today, it’s the turn of Google Magazines to launch in the UK. Announced through GoogleUK’s Google+ account, there are more than 100 magazines ready to purchase, either individually or through a subscription. The store went live last night, but the option to buy didn’t get switched on straight away, however it seems to be up and running now. Publishers such as IPC Media, Future and Hearst are all represented, resulting in a varied collection of titles, including everything from Hello! to the New Statesman. Some areas are lacking though, with the Automotive section being without flagship magazines such as Top Gear and Evo, although both What Car? and Autocar are present. 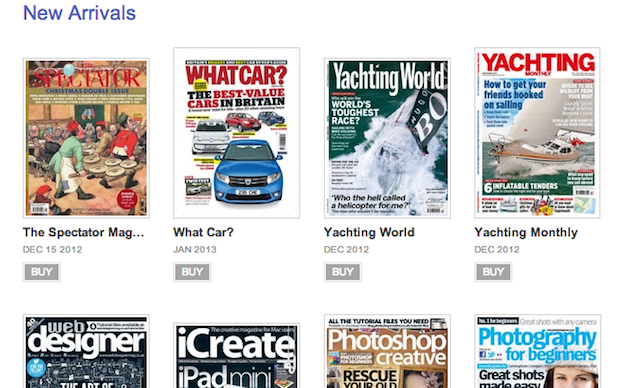 That said, it’s considerably better than Amazon’s Kindle Newsstand offering in the UK. As far as pricing goes, a copy of Golf Monthly will set you back £4.99, while the Official Xbox Magazine costs £5.99. There are some bargains to be had too, as the current issue of Total Film is yours for only £1.99, and Wired for £2.99. Subscriptions are equally as varied, with Wired costing £17.99 for a year, but many come with a free trial period of either 14 or 30 days. Comparing these prices to Apple’s Newsstand sees Wired prices at £1 more in Google Play, but the annual subscription is the same, while Tatler costs £3.99 in both stores. All magazines are listed as being compatible with Android 7-inch and 10-inch tablets, along with Google Chrome’s web reader too. Google hasn’t opened its Magazine store to any other European countries yet, although the tab has appeared in Google Play France and Germany, but could do soon.